In the “refugee” camp just outside of Tijuana, it is beginning to rain. For the hundreds of women and children inside the building, the rain is a minor annoyance. For the thousands of men, women and children who are sleeping outside because there is not enough room inside, the rain is misery added to misery. The voluntary committee of asylum-seekers that is cooking a warm pot of stew for everyone tells us that children and pregnant women will be fed first and then everyone else; they tell us that they just feed as long as the food lasts. Some go hungry every meal. We ask why they give their time to serve the others; “We are family” they tell us. We tell them that we are Christians and we are their family members from the North. They are visibly touched and ask if they can work with us in the future; we are the first visitors to say that to them. Fuller students, Biola and Azusa students are with us along with over 20 pastors. This is the third day in a row that Matthew 25/Mateo 25 leaders and other Christian organizations have been bringing North American “family members” to be a sign of the love of God and to return to tell the story. The new shelter is 15 miles out of town; we have long conversations with the Uber drivers, who sometimes echo conservative voices from the US; Mexico only has enough for Mexicans. Central Americans are unreasonably demanding. However, they often end their stories with a sigh of compassion. One driver says, “They have experienced criminal organizations that are truly parasites, with no bottom to their stomachs. They are eating Central America. They are destroying children; the mothers have no choice but to run.” He hopes that the migrants whose asylum claims are ultimately rejected, like many Haitians who came last year, will be allowed to settle in Mexico and work. He tells us that Haitians are good workers and have contributed to the Mexican economy. The Mayor of Tijuana wants official recognition by the United Nations of El Barretal as a refugee camp, but Mexico would have to be certified as an official “second country” where a certain level of security can be guaranteed. At this point, no one knows if that is possible. One discouraged man tells us. “Both of my older brothers were killed by MS13 because they would not join. They told my mother that I am next so I took my wife and baby to her mother’s house in another town, and I ran. My younger brother and I spoke yesterday; he is considering joining the Mara to save his life but they will destroy his immortal soul. I don’t know what to tell him; I don’t really have hope that we will be granted asylum here. I don’t even have the money for the fees; the little I had went to my sister’s daughter who is in the hospital.” I tell him to please go to the non-profit lawyers who visit the camp regularly and share his story, to not give up. I ask him if he wants to pray and he is eager, praying with me in the Pentecostal style. He is a little comforted by the time the pelting rain forces us to pack up our art supplies and leave. 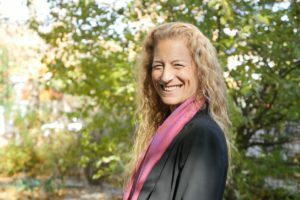 Alexia Salvatierra is Affiliate Assistant Professor of Intercultural Studies at Fuller Theological Seminary.